Los Angeles - Nov. 19, 2012 – Richard A. Lewis, MD, a research and treatment expert in disorders that attack nerves, has been named director of the Electromyography Lab in the Department of Neurology and co-director of the Neuromuscular Clinic at Cedars-Sinai, joining one of the most comprehensive neuromuscular disorders research teams in California. Before joining Cedars-Sinai, Lewis served as vice chief of neurology and director of clinical neurophysiology at Harper University Hospital in Detroit. He was professor and associate chair of neurology at Wayne State University School of Medicine, where he directed the Hiller Amyotrophic Lateral Sclerosis Center. He was also co-director of the Muscular Dystrophy Association Clinic at Detroit Medical Center and Director of the Inflammatory Neuropathy Center of Excellence. “Dr. Lewis is widely known as a leading physician and scientist specializing in inflammatory and inherited disorders that attack nerves. 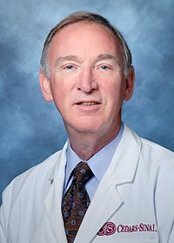 He studies ways to improve diagnostic testing and patient evaluation standards and has been active throughout his career in educational, scientific and advocacy groups for patients suffering from Guillain-Barré syndrome, myasthenia gravis, ALS and other complex diseases,” said Patrick D. Lyden, MD, chair of the Department of Neurology and the Carmen and Louis Warschaw Chair in Neurology. Lewis may best be known for the discovery and exploration of an autoimmune disorder that bears his name: Lewis-Sumner syndrome, a rare disease that attacks the “insulation” around nerves and causes progressive weakness, tingling and pain that usually begin in the hands and arms. Lewis-Sumner syndrome is a variant of chronic inflammatory demyelinating polyneuropathy (CIDP), thought of as the long-lasting version of Guillain-Barré syndrome. Guillain-Barré is characterized by acute progressive paralysis, with symptoms typically improving over weeks or months. CIDP and Lewis-Sumner syndrome are chronic disorders that require on-going treatments to prevent loss of function. Lewis has focused his research on these and other inflammation-related nerve diseases as well as inherited disorders such as Charcot-Marie-Tooth disease, named for the three doctors who identified it in 1886. He began his professional career at the University of Pennsylvania School of Medicine after completing a residency in neurology and a fellowship in electromyography at affiliated hospitals. In 1980, he moved to the University of Connecticut, where he developed the Neuromuscular Program and Electromyography Lab and started an Adult Muscular Dystrophy Clinic with an emphasis on ALS, also known as Lou Gehrig’s disease. From 1983 to 1993, he was clinical assistant professor of neurology at Norfolk’s Eastern Virginia Medical School. He directed a Muscular Dystrophy Association clinic from 1990 to 1993 before moving to Wayne State. Doctors and research scientists in Cedars-Sinai’s Department of Neurology, Neuromuscular Division and Regenerative Medicine Institute search for genetic and molecular defects and study the possibility of stem cell therapies to treat neurodegenerative diseases. Although many variations exist, researchers believe neurodegenerative disorders may have common underlying biochemistries; gaining an understanding of one disease may reveal principles that could lead to therapies for others.